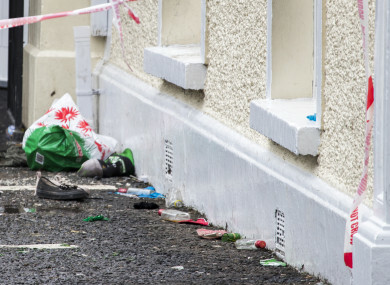 WITNESSES HAVE DESCRIBED the frightening moments when a crush started outside a Co Tyrone hotel where a St Patrick’s Day disco was due to take place last night. Three teenagers were killed in the crush outside the Greenvale Hotel in Cookstown and a number of others are being treated in hospital. One of the deceased has been named as 17-year-old Lauren Bullock, who was a pupil at St Patrick’s College in Dungannon. School principal Catherine McHugh said she was a “shining light in our school community”. The two other teens have been named as 17-year-old Morgan Barnard and 16-year-old Connor Currie. They both attended St Patrick’s Academy in Dungannon. One boy who went to the disco told the Ulster Herald that the teenagers were waiting for the gate to open so they could get in. He said he was pinned down on the ground with other people on top of him for around 20 minutes before he was pulled out. A teenage girl who was caught up in the crush described the panic as she and her friends “screamed and pushed back” when the crowd began to move in. Two of her friends fell to the ground. ‘My friends are on the ground, move back! My friends have fainted, move back! My friends can’t breathe, move back!’ – nothing. Not one bit of movement. The teen fell herself shortly after. “As I looked down I could see multiple bodies underneath me and as I looked up I could see multiple bodies on top of me. It was the most traumatic, frightening and stressful moment of my life,” she said in a Facebook post today. The girl said people in the pile-up were “scratching, biting and grabbing anything they could to pull themselves up to breathe”. Other young people in the group began to pull people out. The two friends she went to the disco with were not injured but another teenager she knew was killed in the crush, she said. Police have said they are working to establish the exact cause of the incident. They are continuing to interview people who were there. A PSNI Major Investigation Team (MIT) has now been appointed to investigate the incident. “Our heartfelt sympathy is with the family and friends of [the victims] who tragically lost their lives last night and all of those who were there and who may be suffering today,” PSNI assistant chief constable Alan Todd said. “A major investigation is underway and I can confirm that a specialist team of detectives has now been assigned to the enquiry. They will seek to establish the full circumstances of this dreadful incident,” he said. Todd said this will be an extensive investigation with “potentially hundreds of witnesses”. The community will understand that this investigation will rightly be painstaking and detailed. “We will proceed in a sensitive manner and our enquiries are likely to take some time to complete. I thank the Cookstown and wider community in advance for their patience and support,” he said. Anyone who was present at the Greenvale last night is being urged to get in touch with MIT detectives. Anyone with any images or footage can pass it to police here. Email “'The most frightening moment of my life': Teens describe crush outside Tyrone hotel disco ”. Feedback on “'The most frightening moment of my life': Teens describe crush outside Tyrone hotel disco ”.